Prince Alexander Sergeevich Obolensky fled from Russia with his family in 1917 and grew up in London. Taking up rugby at 15, at Trent College he scored 222 points in two years before heading up to Oxford University . He won Blues on the right wing, where his pace was his main asset, in 1935 and 1937. In January 1936 his selection for England against New Zealand was far from acclaimed as he was, at the time, not a British citizen (that followed later in the year). Few debuts have been as memorable, as he twice left defenders in his wake to score what many believed were two of the greatest tries by an England player. 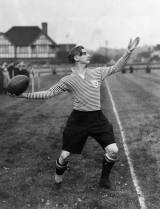 The presence of Pathe News cameras allowed millions to see the highlights of England's first win over the All Blacks, and Obolensky became an overnight star. He was only picked three more times, all in 1936-37, although he played less in 1936-37, dropping out of the Varsity match through lack of fitness, returning to full form the following season. On finishing at university he played for Rosslyn Park and Middlesex, and in late 1938 was included in the final Test trials where, despite playing well in all three matches, he was not picked for the opening Five Nations game. Suggestions flowed that he switch to the left wing, where there was a shortage of talent, and at the request of the selectors he was drafted into a Leicester side in that position as a one-off trial. He hardly touched the ball. Any chance of a recall ended when he was hospitalised after a dog bite. He joined the RAF ahead of the war and continued to play club rugby in 1939-40, representing England against Wales in a wartime international. He died in a training accident when his Hurricane crashed on landing and he broke his neck.